A service of the American Friends Service Committee, we publish it here for your easy review. You can also access this through the AFSC website and also by requesting to receive this summary by email at the AFSC website. “State House Watch Radio” Returns! Chris Sununu, our new governor, was officially sworn in yesterday and took the place of Maggie Hassan on the state’s web-site as well as in the corner office of the State House. The website includes his bio, but not his inaugural speech, which he delivered without a prepared text. Lacking that, we recommend this recap from our friends at NH Labor News. In his campaign and again in the inaugural speech, Sununu was clear that enacting “right-to-work” legislation would be one of his top priorities. For now, suffice it to say, “right to work” is fundamentally about weakening the power of organized labor by obstructing the human rights of workers to organize and bargain collectively. In so doing, it obstructs the ability of all workers to earn decent wages. For that matter, it also obstructs the rights of employers to bargain with their workers as they see fit. We can’t decide if “right to work for less” or “work without rights” is a better name for the legislation in question. Let us know which you prefer, but the key point for now is that the first item on the Senate Calendar for the coming week is a hearing Tuesday at 1 pm on SB 11, the first “right to work” bill. See below for details, and we hope to see you at the State House then. A recent story about the first baby of the year born in Concord revealed that the baby’s father was fired from his job because he went to the hospital with his wife when she went into labor. That this is happening at a time when our new governor and legislative leaders says they support a “right to work” is an almost cosmic coincidence. The IBEW, a union representing electrical workers, has offered the newly unemployed new father the opportunity to apply for a paid apprenticeship. This story underscores the need for workers in our state to have more of job protections and opportunities provided through the kind of collective bargaining agreements that will be illegal if “right to work” becomes law. Also high on the political agenda is the so-called “constitutional carry” provision, which would repeal the current licensing requirement for carrying a concealed handgun. That will also come up next week. We are more than disturbed that the ability to carry weapons without registration is being lifted up as a fundamental right at the same time the ability of citizens to register to vote is facing increasing restrictions. The House met for its first session Wednesday and cast two interesting votes rejecting rule changes proposed by the Speaker. The very first vote of the session was on whether or not to institute a dress code via a rule stating, “When the House is in session, all persons in the House chamber shall be dressed in proper business attire.” The orientation manual for legislators (which apparently does not constitute “rules”) already states, “It is expected that all members will wear suitable attire. Men are expected to wear suit jackets and ties and women are expected to wear business attire.” In any case, the new dress code language was voted down, in a roll call vote of 151-213, thus eliminating the need for a vice-principal to enforce it and send offenders home. On a more serious note, a proposal from the Speaker and his leadership team to eliminate the Child and Family Law Committee was voted down, 192-172. In recent sessions, the committee has often been a venue for contentious grievances over personal custody disputes, which prompted the push to abolish it and disperse its responsibilities to other committees. But the Division of Children, Youth, and Families is under serious scrutiny following the deaths of two toddlers who were killed by their mothers while under DCYF supervision, and an independent review of the agency has recommended many changes, including hiring more than two dozen social workers. With that on the minds of House members, the majority dissented from the proposal to eliminate the Child and Family Law Committee. This week’s House Calendar names the new members of the committee, which will presumably have a lot to say about how the state will overcome the short-comings identified in the report. We wish them well, and hope for a state budget that provides adequate funding. Also of note was a proposed amendment to House Rule 100, which would mean that lobbyists would not be able to testify before House committees until after constituents finished their testimony. This change was soundly defeated, in a roll call vote of 121-242. Leadership on both sides were opposed. There are no House or Senate voting sessions scheduled at this time. There are many new legislators taking office this session, so next week most committees are having orientation sessions. 9:00 AM SB 12, an act repealing the licensing requirement for carrying a concealed pistol or revolver. This bill is back, and has been mentioned as a priority by Governor Sununu. The Senate is starting the new year off with a bang. 1:00 PM SB 11, prohibiting collective bargaining agreements that require employees to join or contribute to a labor union. This is the first of 2017’s “Right to Work for Less” (or “Work without Rights”) bills. In addition to Governor Sununu, the proposal has backing from Americans for Prosperity, the American Legislative Exchange Council, and other anti-worker lobbying groups. The concept originated with white supremacists in the 1930s as a way to prevent black and white workers from uniting. States were given authority to implement “right to work” by the anti-union Taft-Hartley Act in 1947. AFSC-NH has consistently opposed this going back to 1979. We’ll have more to say on this soon. Pro-worker groups, including NH Voices of Faith, will gather in the hallway outside Representatives Hall from noon to 1 pm. 11:50 AM HB 218, relative to activities at polling places. This bill would prohibit the distribution of campaign materials and electioneering inside the polling place. 12:10 PM HB 253, relative to campaign materials at the polling place. This one eliminates the prohibition on wearing campaign materials intended to influence voters at the polling place. 10:00 AM The first in a series of economic and fiscal briefings on the way to creating the next state budget. These hearings will be held twice a week for at least the next few weeks. Information about the presentations can be found in the House Calendar. 9:20 AM HB 110, requiring members of the press covering the legislature to wear name tags when in the House or the LOB. The bill states, “each member of the press corps covering the proceedings of the general court shall wear on his or her outer garment a clearly visible name tag when working in the state house or the legislative office building. The name tag shall consist of the person’s first and last name and the name of the person’s organization.” Arnie and Maggie are already required to wear lobbyist badges when they are at the State House. As the publishers of State House Watch and co-hosts of “State House Watch Radio,” would they be required to wear a media badge as well? SHW researcher Susan Bruce also writes a newspaper column, has a blog, and is the co-host of “The Attitude” on WNHN-FM. Would she be required to wear 4 media badges, or one big badge with a list? We don’t know. But Arnie remembers that the last time a bill of this nature was proposed, members of the State House press corps said that if it were to pass they would comply by wearing their name tags on their posteriors. 10:30 AM HCR 2, a resolution supporting efforts to ensure that students from NH have access to debt-free higher education at public colleges and universities. 1:15 PM HB 279. This bill makes changes to the indoor smoking act. Under this bill, smoking would not be prohibited in public conveyances that are privately owned (we think that means taxis), restaurants, grocery stores, and cocktail lounges. Smoking would be prohibited in privately owned residences where the owner has declared smoking prohibited. This leaves us wordless – and potentially breathless. 1:00 PM HB 155, which increases funding for pupils attending all-day kindergarten. Our first radio show of the new year will be Monday, January 9, on WNHN-FM from 5 to 6 pm. Our guest will be Andru Volinksy, who was sworn in yesterday as a member of the Executive Council. You can catch us live at 94.7 FM in the Concord area or live-streamed at www.wnhnfm.org. The show will be re-broadcast at 8 AM on Tuesday. Podcasts will also be available shortly after the show, thanks to Fred Portnoy, our producer. PORTSMOUTH – “Keeping it Peaceful,” an introduction to nonviolent protest with Arnie Alpert, 10 AM to noon, at South Church, Portsmouth. This workshop is being organized for participants in the January 21 women’s march, but others are welcome to attend. Please register here so we can estimate how many people will be there. PORTSMOUTH – Civil Rights Sundays, a weekly protest in Market Square, Portsmouth, hosted by Occupy NH Seacoast, focused on opposition to the nomination of Senator Jeff Sessions to be U.S. Attorney General. From 3-4 PM. Info on Facebook. NASHUA – “Electing a President: Popular Vote or Electoral College?,” a talk hosted by the League of Women Voters of Greater Nashua, Nashua Public Library, 2 Court St., Nashua, 7 PM. Info on Facebook. CONCORD – “Know Your Rights as a Worker,” a free, interactive workshop sponsored by AFSC, 6 to 8 PM at NH Catholic Charities, 176 Loudon Road, Concord. More info on Facebook. CONCORD – “Learning from History: the Nashville Sit-In Campaign,” a workshop with Joanne Sheehan of the War Resisters League, 6:45 to 9 PM at the Concord UU Church, 274 Pleasant Street, Concord NH. Sponsored by the Building a Culture of Peace Forum. Free and open to the public, with donations accepted. More info on the web, on Facebook, or by calling LR Berger at (603) 496-1056. CONCORD – “Investing in New Hampshire’s Future: Strategies to Maintain a Strong Workforce and a Vibrant Economy,” the NH Fiscal Policy Institute’s 4th annual budget and policy conference, 8:30 AM to 4 PM at the Grappone Conference Center in Concord. See more here. MANCHESTER– Martin Luther King Day Community Celebration, St. George Greek Orthodox Community Center, 650 Hanover Street, Manchester, 2 to 5 PM. Robert Azzi will be the guest speaker. Eva Castillo will receive the 2017 Martin Luther King Award. Info on Facebook or at www.mlknh.org. MLK Day events will also take place in Exeter, Hollis, Hanover, and elsewhere. Watch this space for updates. CONCORD–“Vigil of Hope and Concern” at the time Donald Trump takes the oath of office. Meet in front of State House 11:30 to 11:45 AM, silent vigil noon to 12:15 PM, followed by gathering and facilitated discussion at 4 Park Street. Sponsored by AFSC, UCC Justice and Witness Ministries, Pace e Bene/Campaign Nonviolence, NH Peace Action, and the Equality Center. CONCORD–NH Women’s Day of Action and Unity. “We will unite at the New Hampshire State House in Concord in solidarity with the Women’s March on Washington and in support of our rights, our safety, our health, our families, and our environment. Together, we will send a message to elected officials in New Hampshire and Washington, D.C. that we will stand together to protect the progress we’ve made. We won’t go back!” 10 AM to 3 PM. More info here. PS – Don’t forget to “like” us on Facebook. Search for “American Friends Service Committee-NH” to “like” us. After all, we are your Friends. AFSC’s New Hampshire “State House Watch” newsletter is published to bring you information about matters being discussed in Concord including housing, the death penalty, immigration, and labor rights. We also follow the state budget and tax system, voting rights, corrections policy, and more. The AFSC is a Quaker organization supported by people of many faiths who care about peace, social justice, humanitarian service, and nonviolent change. Arnie Alpert and Maggie Fogarty direct the New Hampshire Program, publish the newsletter, and co-host the “State House Watch” radio show on WNHN-FM. Susan Bruce is a State House Watch researcher and writer. Fred Portnoy produces the radio show. “State House Watch” is made possible in part by a grant from the Anne Slade Frey Charitable Trust. Your donations make our work possible. Click the “DONATE” button on our web page to send a secure donation to support the work of the AFSC’s New Hampshire Program. Thanks! Say NO! to House Bill 386 – NH Taxpayers Cannot Pay Big Business’ Bills! As explained in the write-up from the New Hampshire advocacy group, Citizen’s Alliance, Republicans in the New Hampshire house have put forward a bill, HB 386 that proposes to lower the tax burden for businesses in New Hampshire. Unfortunately as stated in the write-up below, this “burden” is only borne by the largest and wealthiest businesses in the state. These businesses most often are not New Hampshire based or originated, but large global businesses. They will benefit from this cut but New Hampshire residents will have to make up for it. It amounts to a deliberate shift of income upward and out of the state of New Hampshire and the tax burden downward onto New Hampshire residents. The libertarian wing of the Republican party loves to cry about the costs of government and the burden on New Hampshire businesses. But this argument has no basis in fact and instead relies on a myth created during the Reagan years based on the “trickle down” effect that all citizens would supposedly enjoy. The UK’s The Guardian’s take on the Laffer curve (they suffered Reaganomics under Thatcher) : So the Laffer Says Tax Cuts for the Rich? As a direct result of upward income distribution, big businesses have grown since the Reagan years far faster and higher than real growth in the larger economy. They have used that wealth to hire slick lawyers and lobbyists to wager with, bargain with, manipulate and cajole our legislators on the state and national level to push bills that favor their profit margins while screwing the American public. This needs to stop. The only way we can stop this is to take action to stop it. Please read the Citizen’s Alliance summary below. As it says there will be hearings today on the house bill. If you can’t make the hearing, please call or write (email) the members of the committee to tell them to stop large corporations from shifting their tax burden onto the shoulders of New Hampshire residents. This bill is currently in the House Ways and Means Committee. Reducing the rate of the business profits tax (BPT) as proposed in HB 386 would principally benefit the very largest corporations operating in New Hampshire. According to data from the Department of Revenue Administration for 2012, just 397 businesses – or 0.7 percent of all businesses filing a tax return – accounted for two-thirds of all BPT collected that year. All of those businesses owed more than $100,000 in BPT that year. Cutting the BPT rate to 7.0 percent would mean that most of the revenue loss would flow to these very large businesses, most of whom likely have operations across the country and the globe. Smaller businesses would see little to no change in the amount of taxes they owe. In fact, more than 48,000 businesses – or 75 percent of businesses filing a tax return – already owed no BPT in 2012. Cutting business taxes will force other taxpayers to pay for the public services that big businesses use and rely on to succeed. Cutting state business taxes creates a vicious cycle. Lower state revenues mean fewer funds are available to provide aid to cities and towns. That, in turn, puts more pressure on local property taxes. There will be a hearing in front of the House Ways and Means Committee Tuesday 2/17/15 10:30 in Room 202 of the Legislative Office Building. Sign on in opposition to HB 386 here. The proposed business tax cuts would force steep cuts in the public services vital to New Hampshire’s quality of life and its economic future. New Hampshire already faces a substantial budget shortfall in the upcoming FY 2016-2017 budget. Cutting business taxes would only make that problem worse. According to the fiscal note, HB 386 would reduce the business profits tax by roughly $120 million in the FY16-17 biennium and every biennium after that. To put that in perspective, $120 million is nearly one and half times the entire amount of General Fund support provided to the state’s Community College System in the current FY14-15 budget; it is more than three-quarters of amount provided to the University System. In the FY14-15 budget, the Departments of Resources and Economic Development and Environmental Services combined received $67 million from the General Fund. In other words, to afford these tax cuts, you’d have to eliminate these departments almost twice over. Reducing the rate of the business profits tax (BPT) would principally benefit the very largest corporations operating in New Hampshire. According to data from the Department of Revenue Administration for 2012, just 397 businesses – or 0.7 percent of all businesses filing a tax return – accounted for two-thirds of all BPT collected that year. All of those businesses owed more than $100,000 in BPT that year. Cutting the BPT rate to 7.0 percent would mean that most of the revenue loss would flow to these very large businesses, most of whom likely have operations across the country and the globe. Smaller businesses would see little to no change in the amount of taxes they owe. In fact, more than 48,000 businesses – or 75 percent of businesses filing a tax return – already owed no BPT in 2012. Cutting business taxes will force other taxpayers to pay for the public services that businesses use and rely on to succeed. Cutting state business taxes creates a vicious cycle. Lower state revenues mean fewer funds are available to provide aid to cities and towns. That, in turn, puts more pressure on local property taxes. These cuts will increase the strain on New Hampshire cities and towns and their ability to maintain safe infrastructure and vital services that are central to our shared economic future. State aid to cities, towns, and school districts has already fallen sharply over the last decade – between FY 2000 and FY 2015, such aid is expected to fall by more than $250 million after adjusting for inflation. Business taxes are already quite low in New Hampshire. According to the Council on State Taxation (COST), the overall level of business taxation in New Hampshire ranked 34th lowest in the country in FY 2013. COST’s research doesn’t look just at the BPT or BET, but at all the taxes business pay(e.g. property taxes, gas taxes, etc.). It finds that the taxes businesses pay in New Hampshire amount to 4.4 percent of private sector gross state product, below the national average of 4.7 percent and less than 33 other states, including Vermont and Maine. New Hampshire has enacted numerous business tax cuts since 2010, with an untoldimpact on state finances. Since 2010, New Hampshire has made more than half a dozen changes to either the business profits tax (BPT) or the business enterprise tax (BET), from allowing businesses to write off more of their losses for tax purposes to raising the threshold at which businesses owe the BET. Unfortunately, the state still doesn’t know how much all of these changes have cost in terms of lost revenue. If we don’t know the price tag for changes already in place, we shouldn’t put even more on the state’s tab. Tax revenue in New Hampshire – including business tax revenue – still has yet torecover from the recession. After adjusting for inflation, total General and Education Fund revenue in FY 2014 was nearly $290 million less than what the state collected in FY 2008. The combination of the business profits tax and the business enterprise tax together produced $550 million in FY 2014. That’s 19 percent – or $136 million – less than what they generated in FY 2008, after taking inflation into account. Business tax cuts are not an effective means of spurring economic growth. Investments in education, infrastructure, and other services are. Extensive economic research indicates that state business taxes, because they are such a small share of business costs, have little to no effect on businesses’ decisions to locate or expand in New Hampshire. Factors like the quality of our workforce and infrastructure are much more important, but New Hampshire won’t be able to provide those if it doesn’t have the necessary resources. …differences in tax burdens across states are so modest that they are unlikely to outweigh the differences across states in the other costs of conducting business. These other “costs of conducting business” are the most important factors affecting business investment decisions and include the cost and quality of labor, the proximity to markets for output (particularly for service industries), the access to raw materials and supplies that firms need, the access to quality transportation networks and infrastructure (e.g., roads, highways, airports, railroad systems, and sewer systems), quality-of-life factors (e.g., good schools, quality institutes of higher education, health services, recreational facilities, low crime, affordable housing, and good weather), and utility costs. A hearing at the will be happening on Friday, February 13, in Room 210 at the LOB (Legislative Office Building – behind the State House). Show up and support HCR-2, [House Concurrent Resolution 2] the move to get Citizen’s United overturned. You can sign up to testify as to why you think, as a citizen, this resolution and considering an amendment is important. You also can stand by and stare down a politician. Your presence speaks volumes! Also: A constitutional amendment is the ONLY way to overturn the Citizen’s United decision! Therefore, the move is on to get New Hampshire on the list of states to comprise the two-thirds necessary for a convention. The convention would convene for no other purpose than to consider the adopting of an amendment to clarify that corporations cannot claim “personhood”. This bill applies to Congress for a convention under Article V of the United States Constitution for the purpose of proposing amendments to the United States Constitution in order to address concerns raised by the decision of the United States Supreme Court in Citizens United v. Federal Election Commission, 558 U.S. 310 (2010), and related cases. A RESOLUTION applying to Congress to hold a convention for amendments. That the clerk of the New Hampshire house of representatives transmit copies of this resolution to the President and Vice President of the United States, the Speaker of the United States House of Representatives, the Minority Leader of the United States House of Representatives, the President Pro Tempore of the United States Senate, each member of the New Hampshire congressional delegation, and the presiding officers of each legislative body of each of the several states, requesting the cooperation of the several states in issuing an application compelling Congress to call a convention for proposing amendments pursuant to Article V of the United States Constitution. Moveon.org is also having an online petition drive which they will also present to the state legislators. Please sign the petition as well as a citizen of New Hampshire who is concerned about how the Citizen’s United Supreme Court decision is effecting the political discourse in this country. Citizens United vs. FEC – Open Secrets.org – a lot of good links and basic information, updated with new analysis on what the decision has done to the political process. Citizen’s United Supreme Court Decision An excellent detailed analysis of the decision and its meaning and effects from the League of Women Voters of Minnesota with many good links. Money Unlimited In-depth article in the New Yorker from 2012 on Justice John Robert’s work to get Citizen’s United the victory it sought. House representative David Bickford of New Durham (R), representing Strafford, District 3 has sponsored the bill, HB 654 that aims to eliminate the sole source of funding for domestic violence services; a portion of marriage license fees. Action needed now! A hearing on this bill is to be held on February 2nd at the Legislative Office Building in Concord, as explained below, can you make the hearing to testify against this bill? Currently the bill is in the house finance committee, please see the list of committee members at the bottom of this post, please contact them all by phone or email and tell them to stop this attack on domestic violence funding. New Hampshire always works to find inventive ways to fund programs, the use of a small amount from the marriage license fee makes complete sense, takes from no one and works as a means to preserve healthy marriages and families in New Hampshire. As explained below in a plea for action from the public, this bill would effectively starve the only source of steady funding that any domestic violence services have in the state. As we outlined previously in our post Domestic Violence Top Killer in New Hampshire, the lives of women and children hang in the balance when it comes to reaching them in time. Making services such as educational outreach, court advocacy , crisis outreach via phone and then shelters saves lives. Representative Bickford’s thinking behind this bill defy the imagination; as explained even in the text of the bill, only $38 is taken out of the marriage license fee and appropriated to the domestic violence fund. Bickford proposes instead to put these funds directly to the state general fund. What has to wonder, does Bickford not value the lives of women and children? Does the general fund need that $38 more than a woman or child needs a safe way out of violence? If passed this measure would be devastating for the state’s 14 crisis centers that have been struggling to provide services over the last several years due to funding reductions. In 2013 these crisis centers managed to serve over 15,000 people, and these funds could mean the difference between life and death. Last year members of this legislature passed an unprecedented number of domestic violence bills including Joshua’s Law which is considered model legislation by the rest of the country. The Coalition is concerned that without adequate funding for victim services these laws will not be effective. Survivors, as well as members of the Coalition, law enforcement, and other legislatures are expected to testify at the hearing. Please contact Amanda Grady Sexton at the Coalition for more information. This bill will be considered by the house finance committee. The finance committee is a Standing Committee, that is it is one that is essential to basic functions of the house, considers most bills and always exists. It is an important committee and thus is also very large. Because Republicans hold the majority in the house, it is currently majority Republican. Also, because its large, we will simply provide a link to the page that lists all the members and information about the committee. The members’ names are linked to their respective house information listing, with phone numbers and email addresses. We recommend also that you make sure you contact the committee chair, Neal Kurk a longtime Republican representative. While New Hampshire citizens managed to shoo carpet-bagger Scott Brown out of the state and return Democrat Jeanne Shaheen to the Senate and Annie Kuster back to the House on the national level, Democrats have had some losses, mostly in the state house as extremist libertarians along with some extremist Tea Partiers gained control. Some of the traditionally more reasonable Republicans did ride on the GOP slide such as Gene Chandler who Bill O’Brien replaced as house speaker in the 2010 Tea Party sweep. But we’re not here to focus on moderates, we’d rather keep you updated on the people to watch closely this upcoming session, in particular those with extremist, anarcho-capitalists views and ambitions. We’re speaking of course of the self described Free Staters (read more indepth about them here) that have professed to come and destroy state government, break New Hampshire from the union and create their own libertarian paradise, whether the rest of the New Hampshire citizens want it or not. Its important to note that New Hampshire has the largest legislative body in the country with 424 members. State house members, of which there are 400 must fight for their seat every two years, the state senators makeup the remaining 24. The term pay is a total $100 dollars a year, plus transportation expense. As a result the party leadership on either side prefers to spend their time and energy on the more lucrative senate seats leaving most state reps to fend for themselves. This creates a window of opportunity for all kinds of regular folks to run as long as they’ve got the time and money to spend running a campaign and running back and forth to the state house during session time. Those last qualifications tend to weed out the herd so to speak, leaving most often only the self employed, those who have a source of sustenance beyond trading their time and hard labor for cash and the retired. There’s an old saying about who runs in New Hampshire, “The three r’s: the rich, the retired and the —” since the last is not so polite we’ll leave that for you to figure out. Therefore, it was only a matter of time that the adherents to the mission of “Free Stater” takeover would figure out that possibly dismantling from inside might be pretty easy. At least the first part; getting elected. Traditionally, because the districts which break down into wards in larger areas are so numerous, most regular people just don’t pay a whole lot of attention to who is on the ticket. With two or three or even as many as seven seats available for their region, voters will often vote the party ticket they like and be done with it. This has resulted traditionally in all sorts of odd characters getting elected often to the later humiliation of the party they are supposed to represent. But in the case of the Free Staters; they aren’t people on a personal political mission or tangent or people running to protect a pet area of government regulation or grind a particular ax; the Free Staters are on a greater mission and are organized and committed. As a result we’ve seen a gradual trickle of Free Stater followers and believers run in campaigns, usually as Republicans. Democratic wards, particularly those in the larger cities such as Manchester and Nashua, tend to have a diverse population of people who traditionally vote Democratic, whether because of old union sympathies or ethnic differences. They will tend to vote the ticket even if they haven’t had the chance to pay attention as much. Why not? Makes sense, if you are pro-labor you know Republicans aren’t. If you want a candidate who will vote for programs that help poor or elderly people, you’d vote Democratic, Republicans don’t profess to care about poor people or the elderly. So Free Staters have figured out the shotgun approach is best. If all you want to do is get in, no matter how then why not run as a Democrat, especially in wards that typically vote Democratic but may be more socially disenfranchised and may not personally know or even have heard of their house rep or senator. So running as a Democrat has been the Free Stater practice now for at least the last two sessions. As shown here, its a strategy that they refuse to give up on even though this second try shows only one success with that strategy. So without further ado, here’s the list, with the party they ran under also noted and the history (thanks to Granite State Progress for their work on this) of those who have served in the house before linked to their names. We considered putting pictures to the names, but we’re not here to promote these people or their version of libertarianism. Elizabeth Edwards with her wife Caitlin Appell. Like many young libertarians, Edwards has said to some she found a home within the FSP for her sexual orientation freedom. Really? The Democrats have no history of working for and defending LGBT rights? More than likely its that extremist libertarianism might be more appealing to someone who spent some time as an intern at the Koch Brothers’ founded Cato Institute. A part of the obstructive factor of the efforts at forming an Occupy in New Hampshire, Edwards once seemed near an emotional breakdown during an informational presentation about the Koch Brothers corporate web of power, protesting that it was “one-sided” and unfair. What’s interesting to note, besides the one Free Stater, Elizabeth Edwards, the rest that won ran were Republicans, so hopefully people did actually pay attention to some extent. 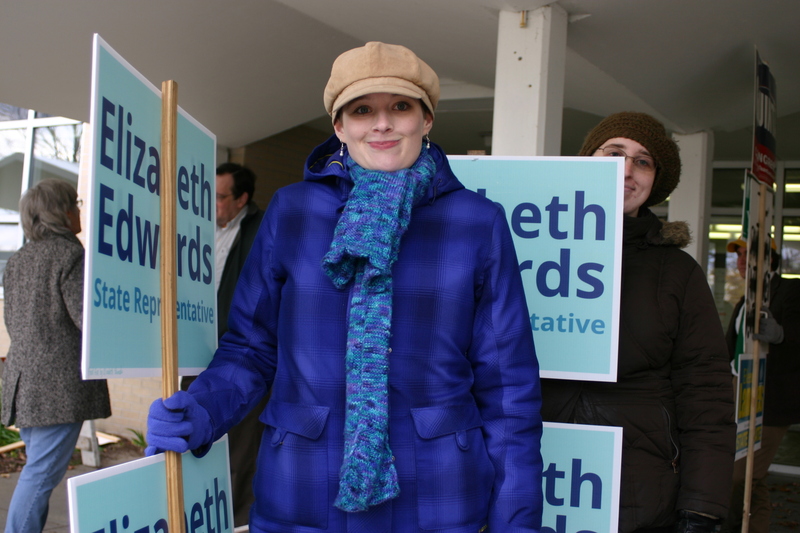 We did find Elizabeth Edwards at the polling place doing her obligatory visibility; only trouble was, she was standing with the Republicans rather than with the Democrats. When asked why she hesitated and then replied, “Well we can be everywhere.” which is true, the candidates and their supporters can stand anywhere. But Elizabeth obviously felt more comfortable standing with the Republicans and Tea Party extremists and two of the Free Staters (that lost their bid, Eileen Landies and Tim O’Flaherty). Too bad for Eileen and Tim since they did have a chance to show their colors last session. Guess that was enough for the voters in Manchester. O’Flaherty immigrated to New Hampshire as a converted Free Stater with the sole intention of running as a Democrat to get into the heart of the political process and begin the mandatory deconstruction. He was quoted during his time in office as saying he “hated serving” because he hated government. He hated it so much he decided to ask for another term. It was also observed that although he ran as a Democrat he regularly caucused with Republicans. For a group of anarchists its really quite something that they consider it worth stretching their anarchist tent enough to allow some establishment Republicans in who seem to have no problem finding ways to increase government. Apparently government isn’t such a problem after all when its used to disenfranchise voters, keep women from exercising their rights to reproductive healthcare and to allow corporations a free ride on the public’s dollar. Unfortunately the Republicans they caucused with last term didn’t seem to be in on their plan to dismantle government and despite their best efforts, last we knew, its still in place ready for a new term of serious civic government peppered with shenanigans of the likes of these folks. We’ll be watching and reporting. Stay tuned. 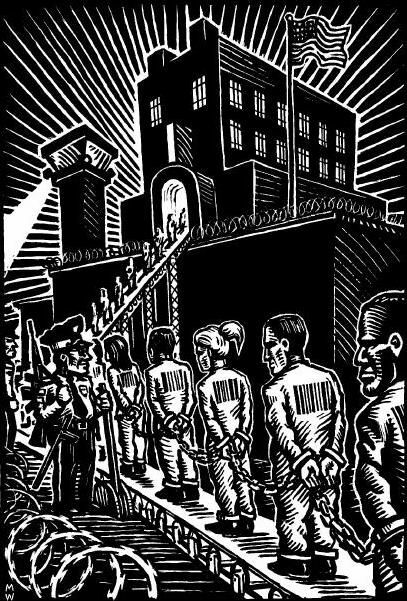 Read more on: Corporate Prison Leaders Tell the Truth About Themselves directly from the source. Demonstrating once again that our American public education system is sadly underfunded, Free State Project adherent and generally creepy, obviously not employed wannabe journalist David Ridley harasses a volunteer New Hampshire state rep. Now, firstly, as someone points out in the comments on the you-tube site, the Department of Ed is a federal program, not a state one and thus it would seem the place to gripe and argue about public education would be on the federal level. But we know that the Koch Brother’s Ground Crew isn’t interested in attacking the federal government, what with having to fight for space with professional lobbyists and all. The best place they’ve determined to put up the anti-regulation/return us back to feudalism cause is at the states. We’ve all seen this in action with the ALEC agenda started with Ronald Reagan in the 80’s. Because well, you know, corporations are just killing themselves for a chance to educate our children, clean our air and water and generally keep us all healthy, happy and able to pursuit life, liberty and all that, amirite? Of course you knew I was joking. Those of you who paid attention in your public school and listened to your union paid certified teacher I’m sure understand the irony of people who can read and write thanks to the public education system saying as adults that they don’t want to pay a share of cost for others. Onto Susan the Bruce wherein the vile video sits. In voting that wasn’t a surprise to most people involved closely in the issue of encroaching wind power and transmission line projects, the NH House Science, Energy and Technology Committee voted to retain most of the bills related to those projects. Garnering the most controversy and attention lately was House Bill 580 that would have stopped all power infrastructure construction in the state immediately upon passage. Representative Rappaport requested an “ought to pass” on the bill with vocal support from Representative Khan, Representative Bradley and Representative Vadney. While Representative Babar spoke of reservations about the wording of the bill, but the most vocal resistance to the moratorium idea came from Representative Nicholas Levasseur. Levasseur seemed to speak a straight industry line, saying that the moratorium will “send a bad message” to businesses that New Hampshire is “fickle” in their support of business decisions. Rep. Bradley also weighed in on the issue, speaking from his military background saying that one thing he learned was the value of deadlines and also the value of delay, that when in doubt oftentimes a delay is the best option to avoid mistakes. Representative Nicholas Levasseur made the final weigh-in, responding that the RPS (Renewable Portfolio Standard) mandate may not be met, that business will lose interest in investing in the state and that the SEC process will assure that delicate regions will not suffer damage or destruction. All bills relating to the electrical power infrastructure in the state were referred to retention which means that the bills will remain within the committee for study. There was discussion of setting up a sub-committee to take on the task of doing more research on the issues that the bills bring up and formulating more substantial bills or one bill to handle these contentious issues. HB 568 – “requiring new elective transmission lines in New Hampshire to be buried.“ Rep. Rappaport moved for “ought to pass”, Reps Khan, Murotake and Bradley voted yes. Rep. Nicholas Levasseur, Rep. Vadney and Rep. Pasteur urged a no-pass saying the issue needed more study. Motion for passage defeated. HB 569 – “requires that all electric transmission lines in the state of New Hampshire be placed within state transportation rights-of-way to the extent possible.” Motion to retain – passed, Reps Bradley, Khan, Murotake and Reilly voted against. Motion to retain by Backus who said, “I believe that issues that underlie this bill merit consideration and retention.” Reilly, the author of the bill said he supports retention to avoid a possible loss on the whole floor. Vote was taken, motion to retain passed with the following voting against retention: Rep. Khan, Rep. Rappaport, Rep. Vadney, Rep. Bradley. Rep. Babar made the general statement, “citizen input is important” possibly in reference to wanting to hear more from his constituents on the issue. Rep. Richard Levasseur wanted to know if the reference to power lines in the moratorium included Northern Pass or if it just referred to power lines related to the wind turbines. HB 586 – “establishes a one-year moratorium on new and pending applications for certificates for electric transmission facilities.” Motion to retain – Rep. Khan, Bradley, Borden and Vadney voted against, motion passed. At this point the committee will be in session tomorrow to discuss options such as setting up a sub-committee to work the bills. This is the time to call your representative in your area, to discuss the importance of preserving the western highlands of New Hampshire and the White Mountain region. The link below will get you to your representative. Also important is to talk to members of the committee that are on the fence on this issue and let them know how that you cannot destroy the environment in order to save it. NH General Court – Who Is My Representative? This Tuesday, March 5 at 1pm the New Hampshire House Science, Technology and Energy Committee will vote on two important bills effecting New Hampshire environmental and energy future: HB 580and HB 484. Both of these bills relate to the expansion of wind turbines in the western and northern regions of the state. Both of these bills currently rest in committee. A large portion of representatives considered “retaining” the bills which essentially means they sit without action for an indefinite period — while energy industries continue unabated with their development within currently outdated and insufficient guidelines and rules. 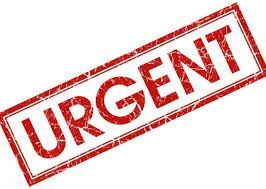 We urge people to call the committee members and their house representatives to tell them to pass these two bills and get them out of committee and onto the house floor for a full vote. Click on the link below for a full listing of committee members with links to their email address and telephone numbers. Most NH Reps are very responsive to citizen inquiries and will answer phones and emails promptly and always will read them. HOUSE BILL 580 proposes a moratorium on any further construction of wind turbines or transmission lines. Linked above, the bill text is short and to the point. A moratorium on any further construction or approval of transmission lines (as originally intended by the bill’s authors) and wind turbine development will allow communities and all stakeholders a chance to develop stricter and more appropriate guidelines for renewable energy development. Industry has threatened that the renewable energy time table will be lost causing the RSP to spin out, they have threatened that they will leave the area, never to come back again if they don’t get what they want now. They also threaten that federal tax credits will soon expire, presumably never to be resurrected again. None of these claims have any basis in reality. Ironically committee members expressed their desire for more information on the issue, many of them stating that they just didn’t have all the facts. Without the moratorium, the SEC will continue its approval process unabated and the people will not have the information and the facts so desperately needed on this issue. The wind turbine industry has threatened that waiting will cause them to look elsewhere; that a wait signals ‘bad to do business in New Hampshire’. Seems rather disingenuous when at the same time industry lobbyists say that they have the communities’ concerns at heart, that they are confident of the quality and sustainability of their product and that they will work with communities. I. The site evaluation committee shall determine whether any part of any structure of any proposed project is visible without amplification to the human eye from public property in a particular city or town. Its determination shall be based on information provided in the application and any change in or amendment thereto, any petition filed under RSA 162-H:7, VII, at any public hearing, and in any other balanced way deemed appropriate by the committee. III. The town or city clerk shall certify to the site evaluation committee the result of the vote in his or her community, and the committee shall total the votes for all participating communities taken together. When this writer talked to some members of the committee, the trust in the SEC and its process was remarkable. But assumptions can be dangerous. Currently the rules that govern the SEC (Site Evaluation Committee) fall under RSA 162-F and RSA 162-H and deal mostly with traditional power generation plants such as gas, coal and nuclear. Unfortunately although the wind industry has developed on some small scale within New Hampshire there exists no firm guidelines for the SEC to follow regarding the development of wind energy in the state. In 2007 a group of industry experts and other stakeholders put together a proposal of guidelines for wind, but the SEC has failed to adopt the proposed guidelines. An amendment was proposed by Bob Backus (d) and Susan Arnold of the Society for the Protection of New Hampshire Forests (SPNHF) that would demand that the the committee recommend that these guidelines be updated and adopted by the SEC. But this amendment was proposed as a compromise to the resistance of some members of the committee to move on a moratorium. While the updating and adoption of the 2007 rules is needed, many see this as still allowing a loop hole through which current applicants can jump through. The amendment fails to mandate that all applications stop until further research and updating is complete. At the working session last Tuesday an industry rep for PSNH spoke of her familiarity with the working group that drew up the 2007 guidelines, noting “I was around then.” She noted that the process took at least a year. Can we or should we depend on the industry to be willing to wait a year or more for the new guidelines to come online? Can we have faith that they will not pressure the SEC to continue their current permitting process and allow development unabated? One has to wonder if the SEC is willing or ready to deal with the complex issues of wind energy if they have not bothered to adopt or even request an update of the proposed guidelines of 2007. Most markedly, if one bothers to scan the guidelines, it is clear that the working group admits that they have only a small amount of data to go on and that further study on the issue of wind energy generation is urgently needed and that was in 2007! Many of the representatives in the committee pointed to the “Antrim Decision” as proof that the SEC does in fact do their job in hearing out a communities concerns and will rule accordingly. Unfortunately, as was pointed out in testimony at the February 19th hearing in Representative’s Hall by an Antrim resident and activist, it took four long hard years for the community to come together — all volunteer — to combat the paid wind industry lobbyists. It is worth noting as well that Antrim was the only town that was able to stop a wind project from gaining SEC approval even though numerous projects have gone online over the years, not all with shining success. Groton Wind Farm, LLC (Iberdrola satellite) already has caused problems that are currently pending before the SEC. Although the issues, placement of buildings and poor road maintenance are disturbing in and of themselves, most troubling is Iberdrola (in this instance Groton Wind Farm, LLC) seems to demonstrate poor management if not outright dishonesty in its practices. The rules governing the SEC process, 100-300 spell out in detail the process by which hearings are held. It is clear from reading the guidelines that general court procedure is followed with rules of discovery, cross examination and petition by the public or “interveners” that may be cumbersome and difficult to navigate for those not legally trained. HB 484 gives more direct empowerment to communities at least on the issue of site placement a more direct and democratic process. TRULY GREEN OR JUST ‘GREEN WASHING’? You know, the “green” packaging at stores, touting that a product has a better carbon footprint of some competitor, that a product’s production used less energy or that a small portion of the product’s content is made up of recycled material? Ever cynically wonder if all that is really true or just a lot of fluff? Ever stop to consider that possibly there’s a certain irony to a company making a profit off of increased consumption while calling itself ‘green’? – wind turbine sites require extensive deforestation for access roads and maintenance buildingsas one person notes on windeffects.org, deforestation removes vital natural environmental scrubbers for CO2 gas. – the irregularity of energy generation by wind requires backup from traditional fossil fuel resources in order to balance out its lackluster and irregular contribution to the power grid. – wind power can only provide an efficiency of around 10-17%, figures of 30% efficiency touted by the industry constitute only the highest efficiency in the best conditions, such is never consistently provided by wind. In fact the only locations in New Hampshire where turbines might have a “good” to “moderate” rating are on the tops of currently valued and protected mountaintop ridgelines. 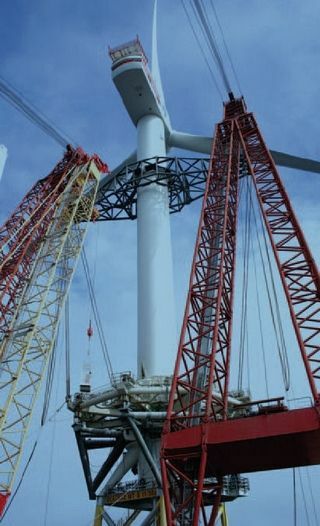 – wind turbines as proposed for New Hampshire and elsewhere are expected to tower at 454′, requiring footings as large as 20′ square, some estimates are as high as 60′ x 20′ deep. The excavation required for any footing is always far larger than the footing itself, so consider this estimate conservative for the destruction of landscape. This is particularly important when considering the ‘bony’, that is rocky terrain of New Hampshire. – currently EPD Energy has plans to move forward on a project that will directly impact the Mount Cardigan State Park and the surrounding towns. Mount Cardigan is a popular tourist destination and part of the Appalachian Mountain Club’s system of with a lodge that hosts nearly 8,000 overnight guests a year and maintains a network of trails throughout the western region. It is estimated that the Mount Cardigan trails serve over 15,000 hikers a year in all seasons. EPD energy’s proposed wind installations will sit directly on current trails impacting this vital gem of New Hampshire’s western region. – the owner of the Rumney Village Store recently told this writer that his business jumps up 600% in the spring and summer months as tourists come to enjoy Newfound Lake, Rock Rumney and the surrounding mountains and hills in the area. They don’t come to walk wide deforested access roads to wind turbines. While a few turbines may not be intrusive, an industrial wind “farm” of nearly 500′ turbines planted close together along ridgelines with access roads to each carved out of the forest is quite another matter. Newfound Lake, a popular destination spot nestled in the western mountains of the state. Prime real estate, natural recreational areas and resources are threatened by wind farms proposed for the area. Finally, the elephant in the room when discussing energy use and generation is conservation. The acceptance of the paradigm of expanded consumption to drive economic expansion and profit must be challenged at its root. While the reduction of greenhouse gasses in the production of energy must continue, this cannot carry on in a vacuum. The time when energy was seen as cheap and easy has come and gone; manifest destiny has played out. We’ve drilled, blasted, dug, carved, scraped and soiled our planet to the point where we lay on the precipice of near destruction. In addition, in the vein of continued consumption and individualized technology we’ve become more disparate and more disconnected from our communities and ourselves. Our national government has become enmeshed with global corporate power on a level never before seen. Disconnected from local communities and their needs, giant corporations intrude on communities to exploit the local citizenry and extract their resources, whether natural or human, for their own profit, returning little if any benefit back. Sustainability for the future must consider the long term health and growth of a community — for its own sake, not for the profit of a few large companies that will inevitably leave the unprofitable mess for the community to deal with. Rep. Burt demonstrating why its important to carry guns at the state house. In a gallant show of concern for over-run PC-style sympathies at the state capital, House Representative John Burt (R, Goffstown) states that flying the state house flag at half-mast in respect of the children lost in the Newtown CT tragedy is another example of the politically correct (otherwise known as sensitive, caring and considerate) folks have gone too far this time. As Susan the Bruce points out quite clearly, Burt knows how and when to show sympathy and concern for children by voting against extending mental health care services for children and voting against the anti-bullying law as well. Good show Burt! 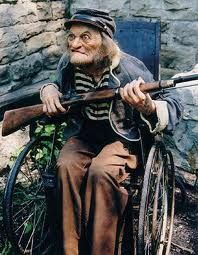 Burt explains that he’s concerned too and thinks its time to arm teachers with guns. Total genius we say, because killing kids has shown to be such a good solution in the past, why not turn schools into an all-out war zone? Teachers have got a bad rap in our society that’s for sure and as recent history tells us there’s no better solution for frustration than a warm gun. In fact, as William Tucker of Miscellany Blue tells us Burt also recently announced that he believes laws are made for breakin’ and that’s just what he’ll do, as in carrying his weaponry where ever he pleases, whether forbid by law or not. Because well, nothing should ever get between Burt’s itchy trigger finger and a short shaft, not even public safety or common sense. Mr. Burt apparently has a website of his own, but you’ll have to look that up yourself, we aren’t into promoting stupid up here in these parts.